The origins of Heiligenbösch are largely unknown. It is assumed, however, that this pilgrimage church comes from around the turn of the century —a time when Archbishop Willigis of Mainz intensified the development and Christianization of the Hunsrück region. However, Heiligenbösch was considered by Mainz to lie beyond the historic "Siesbach border", which once divided the Roman province of Gallia Belgica from Germania Superior and, subsequently, acted as the dividing line between the jurisdictions of the Archbishopric of Trier and Mainz. What is certain is that, on this wonderfully situated site, a large estate stood in Roman times, on whose foundations the church was erected. Not far from here is the Gallic-Roman burial mound of Siesbach, which was established as a family burial ground for a noble Celtic family between the years 167 and 175 A.D. The steeple with its Romanesque double arcade belongs to the oldest part of this pilgrimage church and dates back to the 13th and 14th Centuries. The nave and paintings inside are a good deal more recent. They date, as does the Stumm organ, from the first half of the 18th Century. 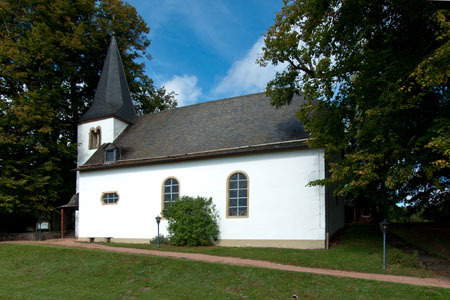 During the Middle Ages Heiligenbösch supposedly had a central function and importance similar to Nunkirch Church in Soonwald region. This is underscored by the frequent country markets and livestock fairs, which were held in the immediate vicinity of the church over the centuries. Especially atmospheric is the churchyard with its old stand of trees, which has withstood all kinds of wind and weather. There is no question that this is an important historical site, which is tightly knit with the history of the Hunsrück region.